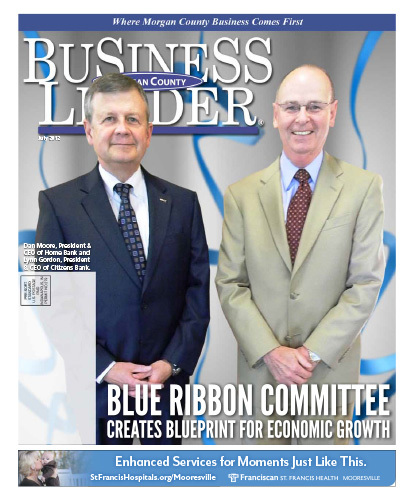 County – charged with the responsibility to explore how Morgan County can realize stronger growth. Morgan County Economic Development Corporation. Morgan County has strong potential for economic growth, but Morgan County must find ways to better work together in order to realize this potential. This is one of the many findings of the committee, and at the announcement reception, it was clear the committee understood this important fact. Dan Moore, president and CEO of Martinsville-based Home Bank, and Lynn Gordon, president and CEO of Mooresville-based Citizens Bank, served as co-chairs of the Blue Ribbon Committee, and provided opening remarks at the reception. Moore and Gordon, who serve as chief competitors in the Morgan County community banking landscape, found they “can achieve more and are stronger by working together than working apart”, Moore summarized. Gordon said with a laugh and smile, “that if the two biggest financial competitors in the community can get along, then anyone can.” Moore and Gordon certainly set the stage for more collaboration and action as they introduced the study’s members and findings. Download the full July 2012 Edition here.